Fishing has continued to be excellent since my last update. 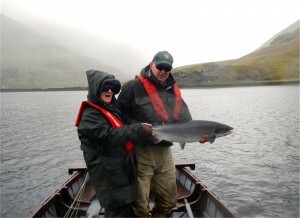 We have had fish every day and there have been some notable catches included. 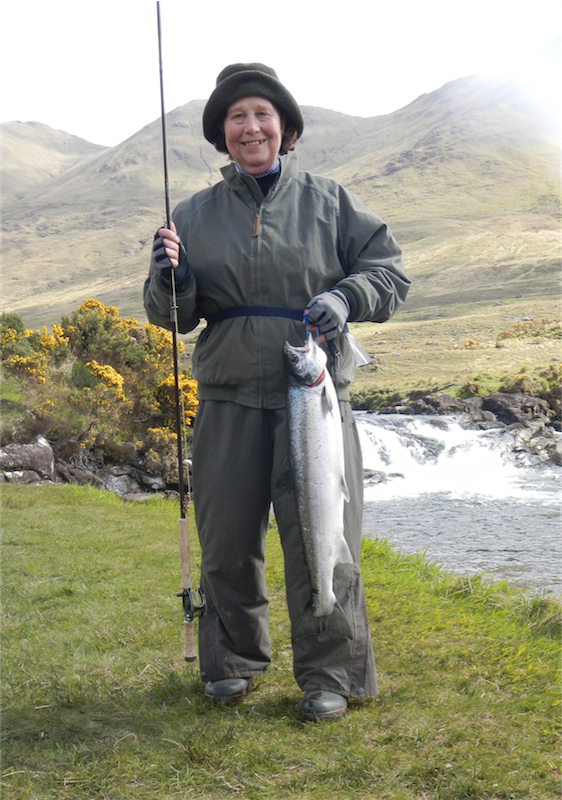 Amanda Higgins got her piscatorial career back on track when she had a sea liced fish of 8lbs2ozs off Finlough on a Delphi Collie, last Tuesday the 21st. On the 22nd Pat O Dwyer had a fish of 6lbs14ozs off the Waterfall (which is definitely back to it’s former glory, having only had 4 off the pool last year, compared to 10 so far this season). 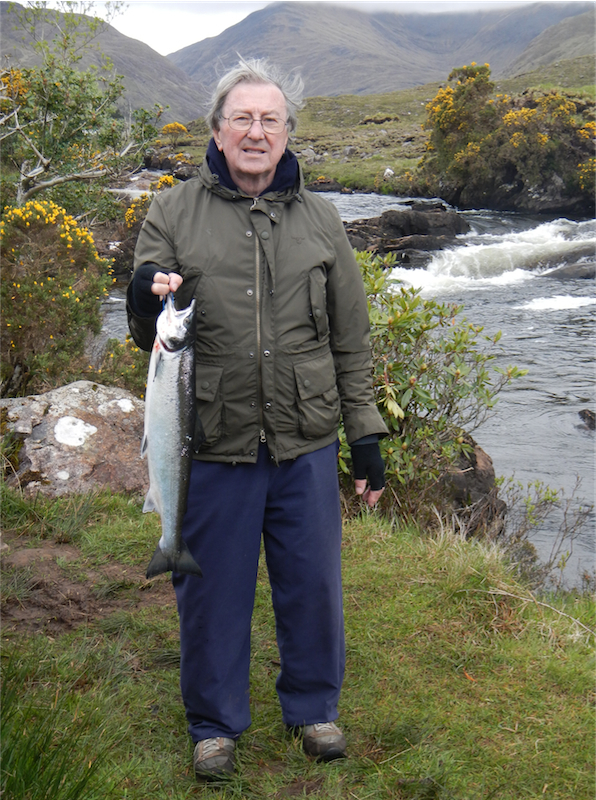 Not to be outdone by his wife, Niall Higgins landed a beautiful sea liced fish of 10lbs on a Delphi Collie again from the Waterfall. We had three fish on the 23rd, the first off the Whin pool of 6lbs13ozs taken by Arthur Jardine on a Cascade. The next two were off Finlough by the dynamic duo of Simon Albertini and Chilton Owen. The fish weighed in at 5lbs10ozs and 7lbs14ozs respectively and were taken on a Cascade and a Delphi Collie. There were six landed on the 24th, five off the river even though the water was 25 and one off Fin. Amanda Higgins was once again on the score sheet, with two from the Whin pool in 20 minutes, both on a Delphi Collie weighing in at 6lbs11ozs and 8lbs13.5ozs. 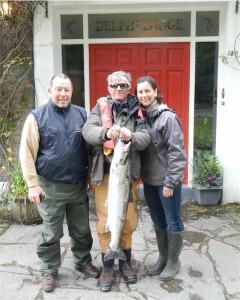 Elizabeth Thompson also had a fish from the Rock pool of 8lbs on a Cascade. Charles Dring saved his week at the death with a 9lbs7ozs fish from the Deadmans, on a Delphi Collie and Paul Welling had one of 5lbs8ozs from the Whin again on a Delphi Collie. Arthur Jardine had the only fish of the day off Finlough, which weighed in at 6lbs12.5ozs and was taken on a Collie Dog. 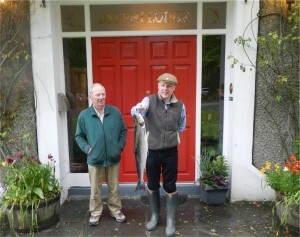 Saturday was a little quieter with two fish landed, both from the river, the first by Martin Ceillier of 9lbs from the Whin pool on a Willie Gunn. The second was taken by Brian O’ Donohoe from the Turn pool on a Gold Shrimp. That brought the total fish for week 21 to 19 which is not bad at all. So far this week the fish just seem to keep coming, with a lot of fresh fish still on the move. On Sunday we had three, with Barbara Ceillier landing a cracking fish from Doo of approx. 14lbs (my own estimate, as I released it) that was just picture perfect. David Walmsley also had one off Doo of 8lbs13ozs. 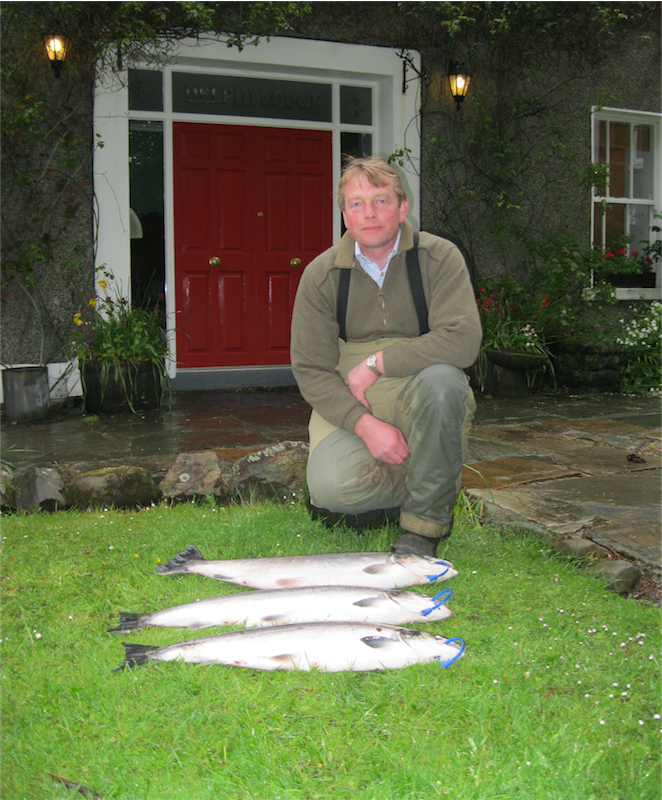 Finally Martin White landed his first ever salmon of 4lbs6ozs from the Waterfall pool on a Sunrae Shadow. Yesterday Finlough was the place to be with six landed. Barbara Ceillier had one of 6lbs8ozs on a Willie Gunn and Alexander O’Sullivan landed his first ever of 10lbs15.5ozs on a Delphi Collie, both in the morning. Then in the afternoon Michael Healy and David Walmsley had four to their boat. Michael had one of 9lbs10ozs on a Silver Cascade and David had three all on a Willie Gunn weighing in at 11lbs11ozs, 10lbs6ozs and 8lbs. 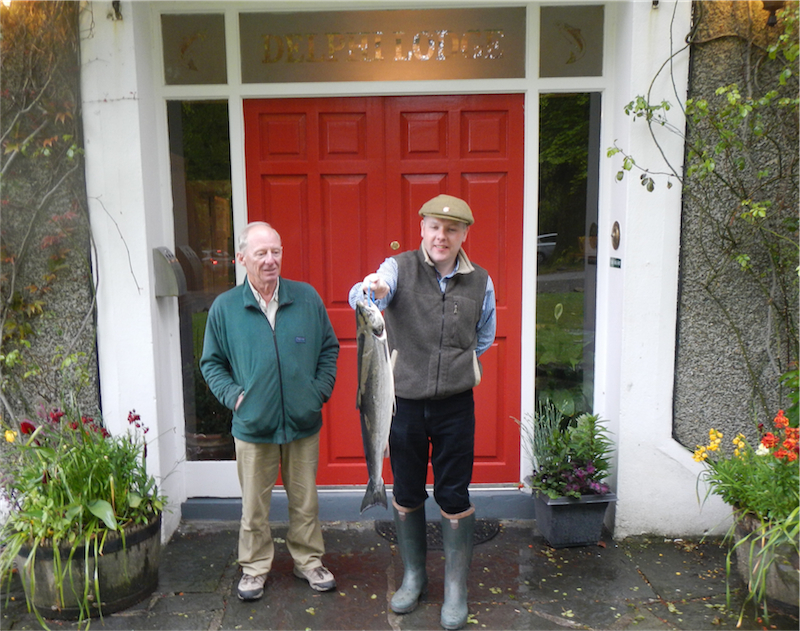 That’s what one would call a great afternoon’s salmon fishing, especially since David had only landed one off Finlough before. So far today we have four landed, three off Finlough and one off Doo. 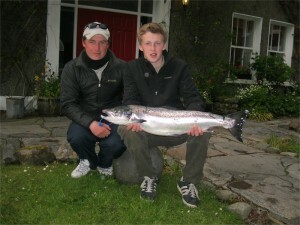 Bertrand Fenart had a fine fish of 13lbs1oz off Fin on a Delphi Collie. Jack Meredith and his fishing partner Steve Brennan (1st on the fly) had one each from Fin stream both on Sunrae Shadow’s weighing in at 9lbs9ozs and 8lbs12ozs. Finally David Walmsley had another, off Doo of 4lbs7ozs. Water conditions are excellent with the river at 60, so I would expect the fish to keep coming over the next while.